African National Research and Education Networks (NRENs) and their member institutions have been advised to continue getting their internet capacity from dedicated research and education networks offered by their regional research and education networks as being on such networks offers more than just affordable connectivity. 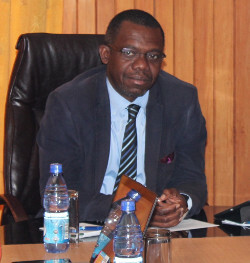 UbuntuNet Alliance CEO Dr. Pascal Hoba sounded the advice against the backdrop of competitive bandwidth rates that some private Internet Service Providers (ISPs) are dangling to emerging NRENs and individual higher learning institutions in Africa. Speaking to NUANCE when unveiling the Alliance’s major action points for 2016, Dr. Hoba said African NRENs that are operating research and education networks should not be concerned by this competition but should instead implement value adding services which their member institutions can assess only when they get capacity from a dedicated research and education network. Dr. Hoba said NRENs that are getting capacity from regional research and education networks like the UbuntuNet network need to understand and convince their member institutions on the benefits of belonging to a research and education network. ‘It is now an undeniable fact that NRENs are offering increased bandwidth at lower cost. But it is time that NRENs made their member institutions aware of the fact that there is more to being on a research and education network than just getting lower priced bandwidth cost. For example, institutions need to understand that users on a research and education network have access to global digital resources and databases and can easily participate in international collaborative research projects with the global research and education community,’ says Dr. Hoba. The CEO then made specific reference to NRENs from the UbuntuNet Alliance membership region which he said stand to benefit from federated services such as Eduroam, eduGAIN and from middleware and Science Gateways applications through the implementation of projects such as Sci-GaIA, MAGIC and TANDEM which UbuntuNet Alliance is an implementing partner. He said it is difficult for African research and education institutions to get these services when they are cut out from the networking world and getting capacity from private ISPs. He revealled that UbuntuNet Alliance has planned to hold capacity building workshops for NREN Managers and Senior University Leadership with the aim of strengthening NREN capacity in the UbuntuNet Alliance membership region. He also revealed that within 2016, the Alliance plans to introduce an annual research innovation award, to be named after a high profile individual from the continent, that will be awarded to an institution or individual that has engaged in a groundbreaking or high impacting research project. The CEO however said the installation of new Points of Presence (PoPs) and upgrading of existing links under the AfricaConnect2 Project as well as the implementation of the three Horizon 2020 projects of MAGIC, TANDEM and Sci-GaIA will be the most critical activities for the Alliance this year.